2013 was a painful year for developed economies, particularly those in the Eurozone. Finland, Greece, Holland, Ireland, Italy, Portugal, Slovenia and Spain all saw their GDP shrink. France and Germany just barely avoided the same fate. 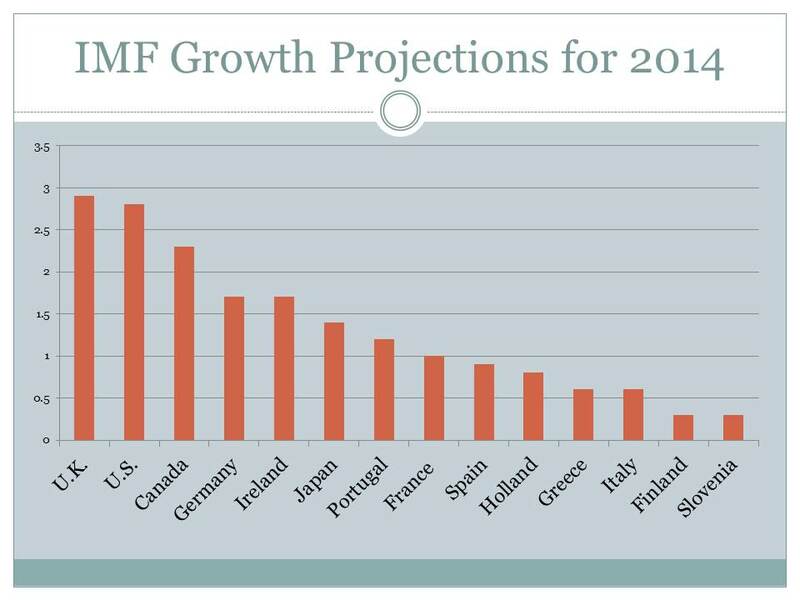 But the latest International Monetary Fund projections for 2014 economic growth are better news for those ailing economies, as well as for the non-Eurozone G7 nations. The chart below ranks these countries from greatest projected 2014 growth (The United Kingdom) to worst (a tie between Finland and Slovenia). Although none of them has a red-hot economy, neither is any of them projected to contract. The biggest projected turnaround from 2013 is long-suffering Greece, whose economy shriveled by a ghastly 3.9% in 2013. The Greeks must also feel relieved that investors seem willing to lend them money again. However, the end of economic contraction does not necessarily mean an end to misery for most people in an economy. Ryan Cooper glumly points out that Greek unemployment is at 27%! That grim statistic underscores how far Greece remains from a healthier economy like the U.K.’s, where respectable economic growth is being projected concurrent with a 5-year low in unemployment. Still, as a whole, the developed world seems poised to move ahead economically in 2014. That’s encouraging news for the millions of its people who spent 2013 hanging on by their fingernails. p.s. In case you are wondering why I use “Holland” instead of “The Netherlands”, it’s because Holland is an ancient Dutch word that translates roughly as “Name for our country that fits on a PowerPoint slide”.